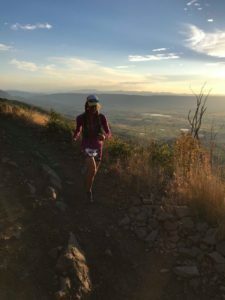 The Wasatch 100 is the last race of the Grand Slam of ultra running, and the toughest by far. 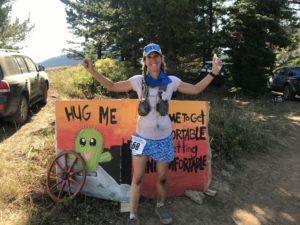 Back in January, running four 100-milers between June 23 and September 8 had seemed like a brilliant idea, but by the time I line up in darkness on a dirt road in the foothills of the Wasatch Mountains near Salt Lake City, I am plagued by serious doubts about the wisdom of my decision, and about my sanity in general. With Leadville just 19 days behind me, I feel lingering fatigue in my bones and lingering soreness in my hamstrings. 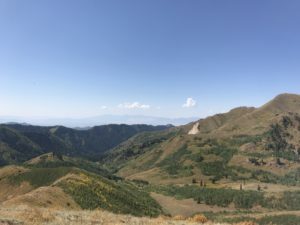 The Wasatch elevation profile looks daunting: it starts with a steep, long climb, then continues going up and down, but more up than down – 25 000 feet of up. Leadville and Western States rack up about 18 000 feet of elevation gain, Vermont only 17000. Wasatch is definitely the hardest course of the four. Its only saving grace is the generous 36-hour final cutoff. I hope I won’t need all of those 36 hours, but it’s reassuring to know I could if I had to. The other thing I’m happy about is the weather forecast: after running a cold, rainy Leadville, and after reading piles of Wasatch race reports full of dire warnings about freezing conditions, I look forward to a hot day. On Friday morning, I know won’t see my crew, i.e. ultra husband David and ultra BFF Tammy, for several hours because the first crew-accessible station is over 30 miles away. We huddle in a group hug just before I find my place in the middle of the pack. 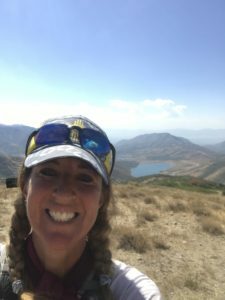 At 5 am, we take off, leaving the lights of Salt Lake City behind us, and below us, on our way to the finish line near the Deer Creek Reservoir, 100 steep, rocky miles south of here. 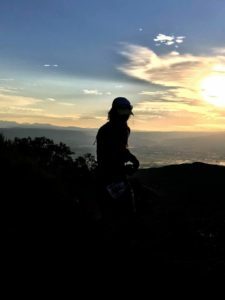 Wasatch is affectionately nicknamed “100 Miles of Heaven and Hell.” We look forward to the joy and the pain of the next 30-plus hours, to the highs and lows we will experience while putting one foot in front of the other. It sounds like a reasonable plan to this crowd of 300 hardy ultra runners and their crews. It may sound like insanity to our non-running friends, but we know they’re just jealous. I settle into the conga line on the steep, narrow single track up Bair Canyon, climbing at a steady pace. It’s still pitch dark. I feel relaxed, mentally preparing for all the tough miles ahead, when a disembodied voice somewhere ahead of me starts screaming “Run!” Wasp attack! The only problem is, there’s nowhere to go. 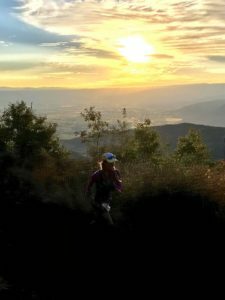 I’m trapped, sandwiched between runners in front and behind me, a steep drop to my right, a nearly vertical uphill on my left, running through a swarm of angry insects. Finally, I reach the top and see Salt Lake City from far above in the pink glow of early morning, a view worth the climb, even worth the pain from the wasp sting. 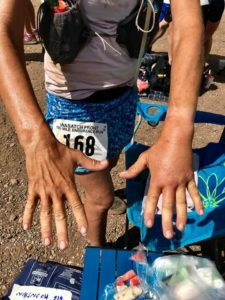 At the first aid sttion, mile 11, the volunteers take a look at my grotesquely swollen hand. 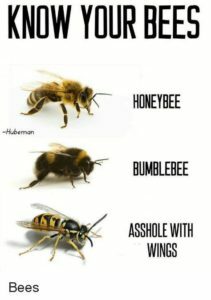 They sound concerned, but agree that, since I got stung two hours ago have not died yet, I likely won’t. 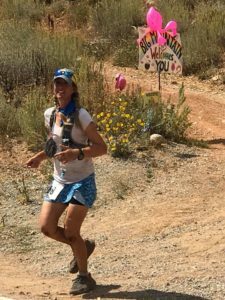 Thankfully, ultra runners treat medical issues with a lot of common sense. I run on, happy that the evil wasp who tried to sabotage my grand slam finish failed. Mission not accomplished, you stupid insect! Views lie this one make Wasatch heaven. The climbs make it hell. I could have taken hundreds of glorious view pictures, but they don’t dod this course justice. You just have to run it! By mile 30, I fall in step with my old friend David Hayes, who is back to running 100s after heart surgery and looking strong. We haven’t seen each other in a long time, so time flies in deep conversation as we run along a beautiful ridge trail and into Big Mountain. My hand looks like one of the pink balloon sculptures that point the way to the aid station. David and Tammy are as happy to see me as I am to see them. They look at my sausage-like fingers with alarm, but try to sound like everything is normal, which is exactly what I need. Best crew ever! The sun is high in the sky by then. It’s getting warm, though not nearly as hot as it did at Western States. I know what to do: time for ice on my hand, under my hat and in my bra, time for cold ginger ale, and watermelon dipped in salt. After so many 100 mile races, the three of us are a dependable team. David and Tammy cool me down, then send me on my way. Ultra BFF Tammy. Words can’t express how grateful I feel to know her. I reach Lambs Canyon, mile 46, in the late afternoon. I pick up my lights, but it’s still early, still sunny, still too warm for long pants. I figure I have an extra pair at Big Water, so I stuff a half zip into my pack and go on The trail leads up another long climb. My legs feel heavy. Time to pull out my head phones for the first time. Slow, acoustic tunes for a slow pace keep me company as I make my way up the mountain in lengthening shadows under the canopy of an old forest. I feel serenity wash over me, from that deep well 100 mile races uncover inside many of us. Left foot, right foot, breathe in, breathe out, to the soundtrack of Mark Knopfler’s guitar, Ryan Bingham’s haunting lyrics, and rustling leaves. Here and now is just where I want to be until my bubble of quiet joy bursts when I catch up to a pig-tailed figure in a blue skirt. It’s fellow grand slammer Bibo Gao, who is usually hours faster than me. My competitive instinct opens one sleepy eye, then wakes up with a jolt. Here and now is no longer good enough – I want to pass Bibo, so I switch my playlist to faster rhythms, kick my feet into a quicker gear, and pull ahead. At Big Water, mile 54, it’s getting dark and chilly. Time for warmer layers. Digging through my drop bag, I realize it contains no long pants. I must have taken them out during one of my last minute reshuffle sessions. Before I can panic, a volunteer named Kathy finds an extra pair in her car, which she graciously lends me. 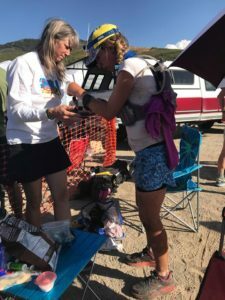 This type of kindness is common in the ultra crowd and one the biggest reasons I love running these races. On I go, thankful beyond words, through the dark mountains, toward Brighton, where my crew is waiting. Soon, I regret the warmer tights. The night is not as cold as I thought it would be. I feel overdressed, but otherwise pretty good as we hike through an old forest, darkness wrapped around us like a velvet blanket. Next to a huge old pine tree, we stop and turn off our lights. I hug the tree. I hug Tammy. We look up at the stars, filled with wonder and gratitude. After that little break, more climbing lies ahead – steep, rocky climbing, for several miles. I remember this part form the elevation chart, which doesn’t make it any easier. My glutes tell me they’re done for the day. My hamstrings threaten to cramp. The urge to whimper and complain becomes almost overwhelming, but I keep it in check while I keep putting one foot in front of the other. “This is the last climb” becomes my anti-whining mantra. How I imagined the rest of the course. Wishful thinking! I take off, expecting an easy cruise to the finish. Instead, I see another steep, technical climb rise before me. My hopes are crushed. The aid station volunteers are not saints, but cruel, vindictive sadists! Tammy is not really my friend – she lied to me! I start crying. I yell at the mountain. It does not care. Tammy tries to push me up the rocky incline, nicknamed “The Grunt” as I find out later. I tell her that I won’t go up there, that she can’t make me. Oh, what pacers have to put up with. “Come on, small steps . . . We’re almost there!” she coaxes, like I’m a skittish horse. “You don’t know that. You’re lying to me!” I mutter, but I do start climbing, in spite of my loudly protesting leg muscles. 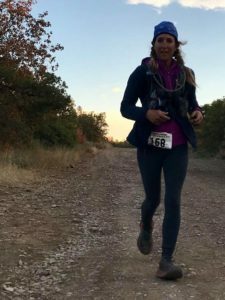 We pass another runner who sits on a rock next to the trail, head in her hands, sobbing. Shared misery makes this tough stretch a little easier. At least I’m not the only this course has reduced to tears! Tammy tries to get both of us to move, but succeeds only with me. After just a few more agonizing steps, we reach the top of The Grunt. 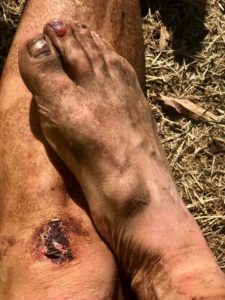 I breathe sigh of relief as I apologize to Tammy for my meltdown, thankful that everything that goes down on the trail between a runner and her pacer stays on the trail. Tammy soon falls behind my suddenly energized pace. She encourages me to go on ahead, which I eventually do, in hot pursuit of that shiny buckle. At the Pot Hollow aid station, Mile 85, it’s getting light already. I look at my Garmin. It’s dead. I look at my phone. It’s 6:30 am. I freak out for a moment, calculating that I have not that much time to spare for a sub-30 hour finish. My brain is too mushy for exact calculations, but I know it’s time to dig deep! For the second time in this race, I put on my headphones, this time blasting my power playlist. I’m glad I saved my performance-enhancing music for mile 85. With help from Freddie Mercury, Chris Ledoux, and the first hint of a glorious sunrise, I scrape up enough energy to powerhike the uphills, then run the a non-technical, dirt road downhill all the way to mile 90. 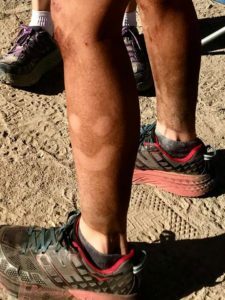 Home stretch, mile 90: new socks, sunlight, and smiley faces on my leg. David has a sense of ultra humor. 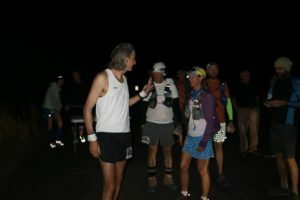 David meets me at the aid station, full of energy and ready to pace me to the finish line. What a welcome sight! It’s getting warm. 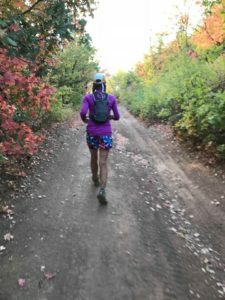 I change back into the running skirt from my drop bag, drop off my lights, put on a hat and sunglasses, and off we go, ready to dig deep for the last ten miles. 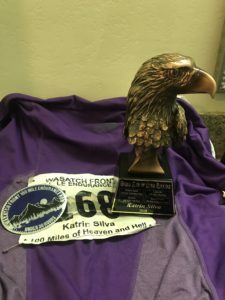 Ten more miles, mostly smooth and downhill, between me and the eagle trophy. We run a couple of sub-10 minute miles. 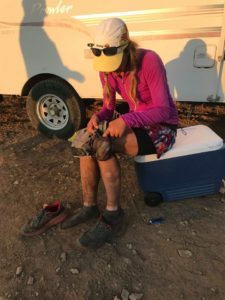 One last aid station, one last slice of watermelon. Some white-faced Herefords stare at us through a barbed wire fence. We cross railroad tracks, then the trail tuns left, along a lake, which seems to go on forever. I fantasize about what I want most right now: a comfortable bed, a shower, a belt buckle, an eagle trophy. How much do I want these things? Enough to keep moving. Not enough to keep running. Another 5k or so. I’m convinced this race will never end. My legs feel wobbly, my brain like a bowl of mashed potatoes. I put my headphones back on for the last time, blasting Don’t Stop Me Now on autorepeat, three times, five times. Thank you, Freddie Mercury! A last loop through a park, then half a mile up a paved road, then, finally, the finish line! I did it! The clock says 28:34, good enough for 5th woman. Done! Nothing feels more amazing than finishing a 100 miler, except, maybe, finishing the Grand Slam. We go back to the hotel for a brief nap, but then decide to return to the finish line for the last hour, the golden hour. It’s the best place in the world to hang out. Our friends, Our people. 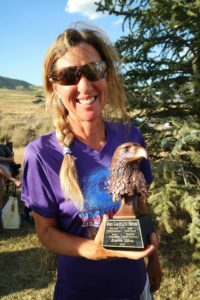 My -our – eagle trophy, finally, after 101 hours and 48 minutes of running. 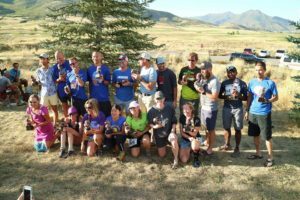 Only 187 of the 300 Wasatch starters persevere to the end, but all 17 of the grand slammers who started reach the finish, a remarkable feat. We are exhausted and dirty, but beaming. Seven of us are women, which must be a record. In 2017, not a single woman finished the slam. 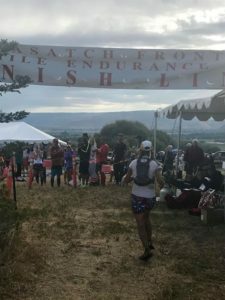 The Wasatch 100 is a tough beast. A curmudgeonly old 100, with a down to earth vibe. It made me cry, but it also made me tougher. Thank you, RD John Grobben and all of the amazing organizers and volunteers who spent so much of their time keeping us safe, motivated, and hydrated. Thank you, Tammy, for your wisdom, your support, your friendship, and most of all for putting up with my whining on that evil last climb. Thank you, most of all, to ultra husband David Silva, without whom I would not be an ultra runner, much less a grand slam finisher. You mean the world to me! Worth all the blood, sweat, tears, and entry fees. My once in a lifetime adventure is over. I already look forward to new challenges in 2019. Suggestions are welcome! There’s a reason this race report is almost three months late. 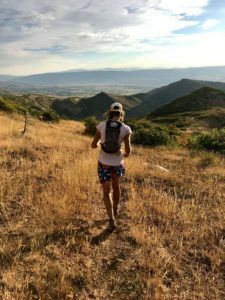 A week after the Wasatch 100, ultra husband David Silva had brain surgery for a subdural hematoma. He was extremely lucky. Now he is back to running and to planning the next season of ultras, but it took me a while to get my PTSD under control and my groove back. David, best ultra husband ever. Please take head injuries seriously, even if they don’t seem like a big deal at the time they actually happen. Live well. Love well. Life is fragile, and shorter than we like to think. It’s definitely too short for regrets. This entry was posted in Uncategorized on December 2, 2018 by silvakat. Wow, what a great story. I probably will not run a 100 miler. But I did run 85 miles on my 85th birthday November 14, 2017. Isn’t it great to accomplish something that you plan to do. Congratulation on your determination to finish. Your mental toughness showed up strongly on the “Grunt Hill”. I cried with you in your story. I was set to finish my little run in 29 hours but my back on my left side had other plans. I Could not stand up straight after mile 73, and it took me 35 hours and 36 minutes to do the 85 miles. But the next day I was fine. One thing I learned about ultras is to train for it and then be mentally prepared. As I studied about ultras I kept finding that there are three things to be aware of as much as training. Mental, Mental, Mental. Oh I also ran 80 miles on my 80th birthday. 23 hours and 53 minutes. Again congratulation on your accomplishments in 2017. Wow, Chuck, you are my hero! What an impressive accomplishment to run 85 miles on your 85th birthday. I am in awe. Role models like you are one of the reasons I’m drawn to ultras. I’m 48, which would be considered a fossil in most sports, but is just average in ours. And yes, the mental piece is so important, which took me several years to figure out.